All Attachin™ Collagen products are isolated from specific tissues (see product manuals) and are purified using a validated manufacturing process that insures inactivation of possible prion and/or viral contaminants. Attachin collagens are then sterilized by membrane filtration and confirmed negative for bacterial and fungal contaminants. Identities and purities of collagens are determined by SDS-PAGE gel electrophoresis. Collagen is the main structural protein in the extracellular space in the various connective tissues in animals. As the most abundant protein in mammals, it makes up 25% to 35% of the whole-body protein content. Collagen, in the form of elongated fibrils, is mostly found in fibrous tissues such as tendons, ligaments and skin. It is also abundant in corneas, cartilage, bones, blood vessels, the gut, intervertebral discs and the dentin in teeth. Collagen constitutes one to two percent of muscle tissue, and accounts for 6% of the weight of strong, tendinous muscles. Fibroblasts are the most common cells that create collagen. Although a number of types of collagen have been identified, all are composed of molecules containing three polypeptide chains arranged in a triple helical conformation. Slight differences in the primary structure (amino acid sequence) establish differences between the collagen types. The amino acid sequence of the primary structure is mainly a repeating motif with glycine in every third position with proline (or 4-hydroxyproline) frequently preceding the glycine residue. Different collagen subtypes are recognized by a structurally and functionally diverse group of cell surface receptors, which recognize the collagen triple helix. The best-known collagen receptors are the integrins α1β1 and α2β1. α1β1 is the major integrin on smooth muscle cells, while α2β1 is the major form on epithelial cells and platelets. Type I collagen is a major structural component of skin, bone, tendon, and other fibrous connective tissues, and differs from other collagens by its low lysine hydroxylation and low carbohydrate composition. Type I collagen is a hetero-trimer composed of two α1(I) chains and one α2(I) chain, which spontaneously form a triple helix scaffold at neutral pH and 37oC. Type I collagen helps in the control cell growth, differentiation, and apoptosis via adhesion to the extracellular matrix (ECM). Cells cultured in three dimensional (3D) collagen gels simulate the in vivo cell environment better than traditional 2D systems. This allows Type I collagens to be very useful in studying cell function and behavior, and the effects of diseases on the mechanical properties of the ECM and the interactive cells. Type III collagen provides structure and strength to connective tissue. It is found in many places in the body, especially skin, lung, intestinal walls and the walls of blood vessels. Collagen III is initially produced as procollagen, which is then modified by the cell using specific enzymes to allow the formation of a stable molecule and then later allow crosslinking to other molecules outside the cell. Type III procollagen molecules are released from the cell and are processed by enzymes that clip small segments off either end of the molecules to form mature collagen, which assembles into fibrils. Type III Collagen is typically used as a thin coating on tissue culture surfaces and acts as a substrate scaffold to enhance cell attachment, adherence and proliferation. Type IV collagen is the primary collagen found in the extracellular basement membranes separating a variety of epithelial and endothelial cells. It is a major component of the dermal-epidermal junction where it is mostly found in the lamina densa. It is a heterotrimeric molecule containing two α1-like and one α2-like chains. Type IV human collagen is typically used as a thin coating on tissue culture surfaces as a substrate scaffold to enhance cell attachment, adherence and proliferation. Type IV collagen may be used to culture epithelial, endothelial, muscle, nerve and many other cell types. Additionally, this product is suitable for use as a substrate for collagenase assays and positive controls. Type V collagen provides structure and strength to connective tissue and is found especially in skin, lung, intestinal walls and the walls of blood vessels. Type V collagen forms a triple helix composed of a α1(V)2 α2(V) chains and is useful to enhance cell attachment and proliferation of a variety of cell types. 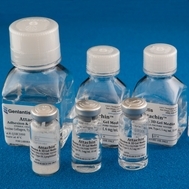 Genlantis offers a collection of collagens under the Attachin™ Adhesion and 3D Gel Media category. All of the Attachin collagens are produced using rigorous and controlled production processes that yield the highest quality products for life science research.